Two questions regarding feline heartworm prevention are addressed in this issue’s column: Is it necessary to test cats for heartworms prior to starting preventive therapy? And, is yearly testing necessary in cats receiving heartworm preventive? The Heartworm Hotline column is cosponsored by Today’s Veterinary Practice and The American Heartworm Society (heartwormsociety.org). This series presents questions and answers on topics related to heartworm infection, prevention, diagnostics, and/or treatment. My practice is in an area of moderate to high heartworm prevalence. We make a dedicated effort to ensure that all clients’ dogs are receiving heartworm preventive and, based on the American Heartworm Society guidelines (heartwormsociety.org; Veterinary Resources), I am now promoting feline heartworm prevention. 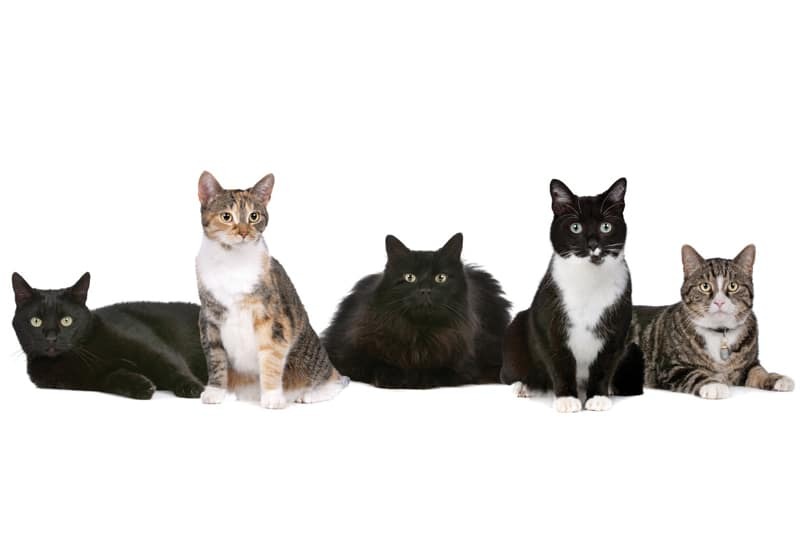 A long-time client and I discussed heartworm prevention for her 4 indoor/outdoor, adopted cats that are routinely vaccinated, but do not receive heartworm preventive. After explaining that cats can become infected with heartworms and there is no definitive therapy, she decided to pursue heartworm prevention. However, when faced with the fees for initial heartworm tests, preventive medication, and follow-up tests, the owner changed her mind, stating that her decision was economically based. This experience raised the following questions in my mind regarding feline heartworm. 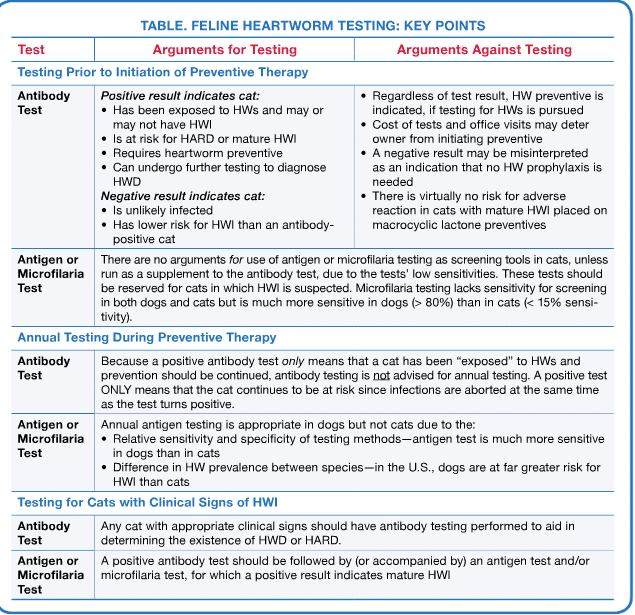 Is it absolutely necessary to test cats for heartworms prior to starting preventive therapy? Is yearly testing advisable/necessary in cats receiving heartworm preventive? This is an excellent and somewhat difficult question, particularly when product labels on heartworm (HW) preventive products advise or sanction “testing” prior to administering the product. Medically speaking, I personally believe that neither testing prior to initiation of preventive therapy (pretesting) nor yearly testing are necessary or even advisable in a case such as yours—in which the client declined preventive therapy due to the costs of initial and follow-up testing. Is involved in the decision to test or not to test. The HW antibody test reacts to the protein(s) associated with the L4 larval stage. Patient is at risk for HW-associated respiratory disease (HARD),2 which is related to immune-mediated or treatment-related death of immature adult worms, and mature Dirofilaria immitis infection. The owner can be offered the opportunity to pursue diagnosis of heartworm disease (HWD)/HWI, including an antigen test, complete blood count, thoracic radiographs, and echocardiogram. In addition, the owner can be advised that the cat could eventually develop severe, even fatal, cardiorespiratory disease. The cat is likely at less risk for HWI than a cat that tests positive. 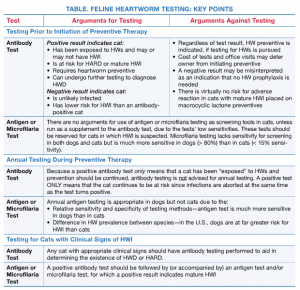 A negative test should not, however, be used to determine whether cats are free from risk for HWI. The conclusion that a cat is not at risk for HWI is based on many factors (besides a negative antibody test), including whether dogs in the community are on HW preventive, if populations of coyotes are present, and the cat’s indoor/outdoor lifestyle. Regardless of the test result—positive or negative—HW prevention is indicated. The cost of the testing and associated office visits may very well deter the client from initiating preventive, particularly in the instance of a multicat household. A negative test may be misinterpreted as an indication that no HW prophylaxis is needed. However, as mentioned earlier, a negative antibody test does not mean there is no risk for future HWI. There is virtually no risk of an adverse reaction in cats with a mature HWI placed on a macrocyclic lactone preventive. This is because cats are rarely infected with microfilariae and, if microfilariae are present, their number is small. If, despite this, there is concern about an adverse reaction, a microfilaria test (direct smear, modified Knott test, or millipore filter test) can be performed. An HW antibody test becomes positive early in HW development, reacting to antigens of the early larval (L3 and/or L4) stages. This is also the point at which macrocyclic lactones exert their effect in aborting developing/maturing HWI. Therefore, in exposed cats on HW preventive, antibody tests are expected to remain positive for > 6 months. A positive antigen test means that a cat has been exposed to HWs and that prevention should be continued. A negative antibody test neither indicates that a cat is no longer at risk for HWI nor that HW preventive should be terminated. Therefore, annual antibody testing for cats on HW preventive is not advised. There are virtually no arguments for use of antigen or microfilaria testing as screening tools (pretesting or yearly) in cats, unless run as a supplement to the antibody test. Some owners, after discussion of cost:benefit ratio, may prefer to have the tests run in tandem for peace of mind. A positive antigen test indicates a mature HWI and the presence of at least 1 mature female worm. Due to the test’s low sensitivity, it is not considered useful as a routine screening test in asymptomatic cats. Microfilaria testing is very specific; a positive test indicates the presence of at least 1 mature female and 1 mature male worm. This testing should be reserved for cats in which HWI is suspected. It is important to emphasize the context of the previous discussion—screening asymptomatic cats. However, HW testing, particularly the antibody test, is underutilized in cats with coughing, wheezing and, in some instances, dyspnea. HW antibody testing is important in coughing cats because the radiographic appearance of HWD in cats is often minimal, or worse, mimics feline bronchial disease (“asthma”), resulting in misdiagnosis. Therefore, any cat with appropriate clinical signs—cough, wheeze, dyspnea—should have antibody testing performed to rule out HWD or HARD. A negative antibody tests means that neither HWD or HARD is likely and that bronchial disease is the most probable diagnosis. A positive antibody test should be followed by (or accompany) an antigen test; a positive result indicates mature HWI. Annual antigen testing is appropriate in dogs but not cats due to the relative sensitivity and specificity of methodologies used and difference in HW prevalence between species. The antigen test is used for screening in dogs; currently there is no canine antibody test. The antigen test is much more sensitive in dogs than cats (but very specific in both species), providing fewer false-negative results. In the U.S., risk for HWI is much greater in dogs (approximately 10-fold) than cats. This article is the last in the first installment of the Heartworm Hotline column. We want to extend our sincerest thanks to Dr. Atkins for sharing his amazing knowledge on this topic with us and to the American Heartworm Society for working with us to bring this knowledge to our readers. We look forward to the return of Heartworm Hotline in future issues. Read all the articles published in the column at todaysveterinarypractice.com (search Heartworm Hotline). Advantage Multi for Cats: At the discretion of the veterinarian, cats older than 6 months of age may be tested to determine the presence of existing heartworm infections before beginning treatment with Advantage Multi for Cats. Heartgard for Cats: It is recommended that cats should be tested for existing heartworm infection prior to starting treatment with Heartgard for Cats. Cats already infected with adult heartworms can be given Heartgard for Cats monthly to prevent further infection. Revolution: At the discretion of the veterinarian, cats > 6 months of age may be tested to determine the presence of existing heartworm infections before beginning treatment with Revolution. Miller MW, Atkins CE, Stemme K, et al. Prevalence of exposure to Dirofilaria immitis in cats in multiple areas of the United States. In Seward RL (ed): Recent Advances in Heartworm Disease. Proc Annu Heartworm Symp 1998; pp 161-166. Dillon AR, Blagburn BL, Tilson DM, et al. Immature heartworm infection produces pulmonary parenchymal airway and vascular disease in cats. Annu Heartworm Symp Proc 2007. Atkins CE, Ryan WG. CVT update: Diagnosis and prevention of heartworm disease in cats. Kirk’s Current Veterinary Therapy: Small Animal Practice, 13th ed. Philadelphia: WB Saunders, 2000, p 782. Atkins CE, DeFrancesco TC, Coats JR, et al. Heartworm infection in cats: 50 cases (1985–1997). JAVMA 2000; 217(3):355-358. Bayes T, Price R. An essay towards solving a problem in the doctrine of chance. Philosophical Transactions of the Royal Society of London 1763; 53:370-418. Courtney CH, Zeng Q. Comparison of heartworm antigen test kit performance in dogs having low heartworm burdens. Vet Parasitol 2001; 96(4):317-322. Atkins CE. Comparison of results of three commercial heartworm antigen test kits in dogs with low heartworm burdens. JAVMA 2003; 222(9):1221-1223. Bowman BB, Atkins CE. Heartworm biology, treatment, and control. Vet Clin North Am Small Anim Pract 2009; 39(6):1127-1158. Clarke Atkins, DVM, Diplomate ACVIM (Internal Medicine & Cardiology), is the Jane Lewis Seaks Distinguished Professor of Companion Animal Medicine at North Carolina State University. He is also a member of the Today’s Veterinary Practice Editorial Peer Review Board and American Heartworm Society’s Executive Board. Dr. Atkins received the 2004 Norden Award for excellence in teaching. His research involves canine and feline heartworm disease and pharmacologic therapies for cardiac disease. Dr. Atkins received his DVM from University of California–Davis and completed his internship at Angell Memorial Animal Hospital in Boston, Massachusetts.